Just in time for Christmas a wonderful book for your children explaining the true meaning of Christmas. I thought I might have a problem sharing this book with some my grandchildren. But, after reading the book myself I found this is a great way to introduce the true meaning of Christmas to young children when they are ready. We have always shared the story of Jesus birth with our children and grandchildren. So, it was a pleasure to read this story to my grandchildren. I just love the writing style and the illustrations. This book will make a great stocking stuffer for your grandchild. 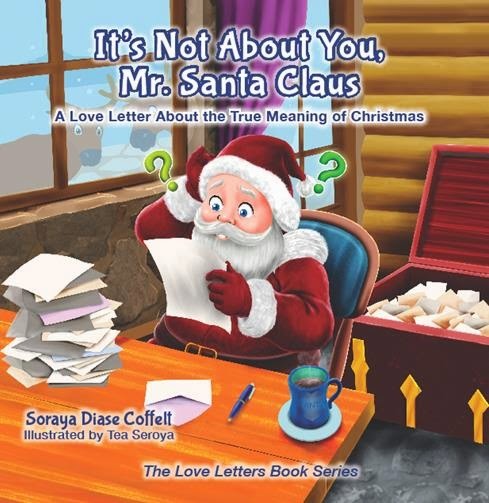 To purchase "It's Not About You, Mr. Santa Claus" visit As the Stars of the Sky. To enter the giveaway for a chance to win one of Three copies, visit the As the Stars of the Sky web site and make a comment here about something you like about this book. Each comment you make will count as one entry. Leave an email contact in the same comment if your comment is not linked to your email. The giveaway drawing will be held on December 4th. The winners will be contacted by email and have 72 hours to respond. This book is also promoted on Grandma Bonnie's Gift Guide. I love the way thus book explains the true reason for Christmas. And it has beautiful illustrations to go along with it. It's refreshing to see a book like this. It looks like a great book. HI, Excellent book... AND--that is something all families with young children should have and either read to them, or have the children read it... SO important. We have lost the true meaning of Christmas and we need to get it back. A great holiday book to teach your children about the true meaning of Christmas.